Home creativity and the inner journey Why Do You Write? I thought, yes, it’s true, I have reached into myself and found myself in unexpected ways through my writing, found truths about myself and my life that would have remained hidden otherwise. Through my stories and my characters I have heard the song of my soul. But how to keep the channel open? How not to forget, as I have done time and again, that my writing is a pathway to my truest self, often so different from the busy self that runs my day to day life? It’s not easy and, I realized, it’s exquisitely easy at the same time. A maddening, mystifying paradox, whose truth brings me to the core of why I write, whose revelations I don’t always understand or, more importantly don’t always want to understand. And yet if I did, if I embraced the song of my soul that I hear through my writing, might my writing and my life flow from a calmer, richer place? Please post your writing here! i've had the exact same experience with my journals. most of the time we live in a state of oblivious amnesia (as redundant as that sounds, it's necessary I think, since not only have we forgotten that there is such a space, such a self, as that endlessly unraveling lovely one, but we've also forgotten that we've forgotten it!) or what Virginia Woolf calls moments of non-being. How strange it is, yet comforting, to hear the experience shared and articulated again and again, particularly with women writers such as ourselves. Why do I write? To be a voice for the millions we overlook, that we don't hear, that we underestimate - to be a voice for the generation that is the future. 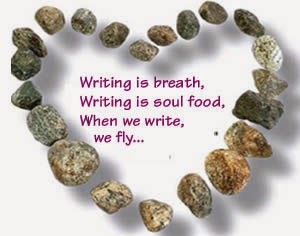 I also write to escape my own 'crap', to envision and feel another life, soul, that I know is out there.